Slater and Kelly are sitting together at The Max, a model volcano rests upon their table. Jessie tells Slater that they make a great team and they'll surely win the science fair. Yet, when it comes down to picking a name for the volcano, these two just cannot seem agree. Mount St. Jessie or Slater's Crater? Both a pretty weak names if you ask me. Slater pours too much vinegar into the volcano and it bubbles over causing them to flee the Max with Jessie complaining about lava stains on her clothes. Zack smoothly enters. He walks up to Screech and tells him he's not going to do any work on their science project. Screech is basically thanking Zack for it. I can see why Zack is friends with Screech, even if Screech is one of the most annoying characters ever portrayed on television. Their science project is an electromagnetic aerial hymonopha (or something of that nature) detector. It makes Screech's canary fly into the wall. 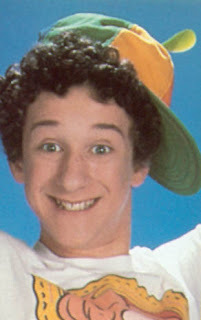 Screech pines for Lisa and Kelly encourages him to ask her out on a date. Zack brings up the point that Einstein was never seen with a "chick." As Screech approaches Lisa with arms outstretched another, blacker gentleman swoops in. Screech cannot figure out why girls don't like him. His theory: he's snake spit. My theory: he's incredibly annoying. At Screech's house, Screech mopes in a beanbag chair. Zack is going to set Screech up and teach him how to make the ladies love him. He feeds him so corny lines and gets fed up very quickly with Screech's back talk. 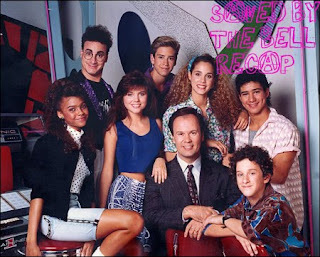 Back at Bayside, Screech hits on Sally Dunsky and falls into a trash can. She's fairly angry at his come-ons. He then asks her if she knows that worms are a good source of protein and then accidentally fumbles one of Zack's lines into an insult. Way to go Samuel. For a guy with the last name Powers, he sure is a weak nerd. 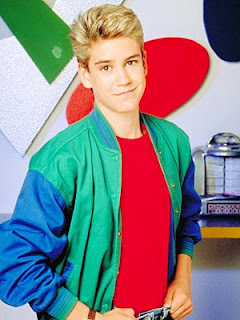 Screech hides in his locker and Zack says he has somebody who might be perfect for him-- Jessie. Give me a break, Jessie is the shallowest character on this show. Zack builds Screech up to her and then tells her who his friend is and she sort of pukes in her own mouth. Zack tells Screech that at 3:30 at the payphone his mystery woman will call him. As we come back from a commercial break, we see Slater on the payphone. If he's on the phone then how will Screech receive his phone call? There is just so much intrigue in this episode. Screech threatens Slater. Slater asks why this call is so important and is shocked when he finds out it's from a girl. Slater offers some advice and leaves. Mr. Belding enters a bathroom stall with a newspaper. The phone rings. Screech moves like lightning to answer it. He sprays banaca into his mouth, yet it's a phone call. How hilarious. Zack enters the bathroom speaking like a lady on his cellular telephone (it's as big as a brick). He says his name is Bambi. Mr. Belding is very confused and is answering back to Zack's love talk aimed at Screech. Zack leaves as Belding goes on a diatribe about how the restroom is the one door that education shouldn't open. Slater enters. Belding continues to prattle on and is then embarrassed by Slater. The audience giggles at the toilet flushing. Belding is flummoxed and vows to never go to the bathroom again. In class, Screech tells Zack about his chat with Bambi the previous night. Lisa enters and Screech proclaims himself taken to her, to which she rolls her eyes. Zack says that Screech cannot meet Bambi because she's having an identity crisis. He feels pretty badly about it. Screech has chained himself to a locker to demonstrate his love for Bambi. He can't eat, sleep or do science projects. The last one particularly piques the interest of young Morris. In Belding's office, Belding has a heart-to-heart with Screech. Screech still has a pair of lockers attached to his wrist. When Screech says his lady friend is Bambi, Belding's interest is raised tenfold due to the bathroom incident. Belding calls Zack into his office. Kelly goes into Belding's office to use her locker and leaves. Belding demands that he presents Bambi to Screech at The Max this afternoon or else. At the Morris household, Zack is pacing as Lisa and Jessie enter his room. They're going to make Zack look like a lady. This is the sort of logic one jumps to in a sitcom or because they're having issues with their sexual or gender identity. Jessie wants Zack to shave his legs, which he obliges. At The Max, Screech goes to his table and Max does some truly terrible magic (as usual). Lisa and Jessie take a pair of seats to watch. Some homosexual hits on Zack as he enters. He walks over to Screech's table and is presented with some fake flowers (a gift from Max). Screech introduces Slater to Bambi. Screech goes to get Kelly to introduce her and Slater tells "Bambi" that Screech has good taste. Zack slaps him lightly and calls him fresh (in a bad way, somehow). Slater instantly recognizes that it's Zack and tells him that he has nice legs. Kelly recognizes Bambi from somewhere, perhaps Brownies. Slater wants Screech to kiss Bambi to show Lisa how over her he is. Zack/Bambi lays down his rules for dating instead: shave his birds, straighten his hair and dye it blond and get rid of that no good Zack Morris. Screech thinks it over, but politely declines and leaves to finish their science project. Kelly invites Bambi to the ladies room, as Zack is getting up to go Jessie grabs him and tells him to freeze. Classic. The End. This episode raises a lot of issues about gender and sexuality but then just leaves them there instead of answering them. Maybe this is why I became who I am today. homosexuals existed in the 1989? ?